Well met, intrepid readers—and welcome back to the darkest corners of the Crossroads! 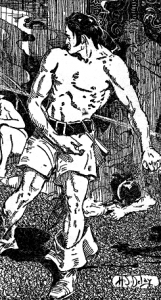 In my recent articles for Kobold Press, I’ve been celebrating the legacy of pulp literature in gaming by developing some home-brewed campaign material inspired by Robert E. Howard’s Hyborian Age. Hopefully, you braved the trip to dead Xuchotl with me in Lost Cities: Ideas for Ancient Ruins in Pulp Adventures. And—if you’re lucky—you survived an encounter with The Crawler in Eldritch Horrors: Two Supernatural Terrors. Today, we head back to lost and legendary Xuchotl to plunder the harrowed catacombs of their priceless treasures. And fellow devious gamemasters can rest assured: for the secrets of this accursed city are guaranteed to taunt and terrify your PCs before they’ll be rightfully claimed. Given its reputation as one of the more supernatural adventures in Conan’s storied career, “Red Nails” offers an interesting case study for what happens when the risks aren’t merely worth the rewards, but are—in fact—among the rewards themselves. After all, if there is one among us who understands the old axiom “all that glitters is not gold,” it’s Conan the Barbarian. And while your players (quite unlike our skeptical Cimmerian) may have grown weary of the classic wondrous items you’ve thrown their way thus far, this trio of treasures from Howard’s Hyborian Age should shake things up a bit. At the top of our damnable list, the burning skull can be a particularly lethal item if used unscrupulously on lower-level PCs, so discretion is advised. Meanwhile, the pipes of madness offer a distinctly Lovecraftian twist to this terrible trove (not at all out of place for the Mythos maestro Howard). Finally, the rod of hellish grounding (also known as Tolkemec’s Wand) is a curious item that ultimately relies more on the geometry of the battlefield and maneuverability of the players than the tumble of the dice. And while these magic items for the Pathfinder Roleplaying Game aren’t cursed, they should certainly be handled with care—this forbidden plunder is forged of “black magic and wizardry conjured out of the black night of the catacombs.” The kid gauntlets are off, ladies and gentlemen. It’s all or nothing in the Hyborian Age. Here, we play for keeps. Slot head; Price 86,500 gp; Weight 2.5 lbs. This appallingly misshapen human skull radiates an unholy nimbus of spectral light. A burning skull—though alien and monstrous in aspect—is undeniably human, and is large and hollow enough to be worn as a helm by any Medium-sized humanoid. To gaze upon a burning skull freezes the blood and withers the brain of one who understands not its mystery. A burning skull radiates an aura of spectral light, which works like a continual faerie fire spell. Any creature who looks into the hollow eyes of a burning skull without passing a DC 30 Knowledge (arcana) check must make a successful DC 23 Will save or become fascinated for 2d4 rounds. Three times per day as a swift action, the burning skull can direct a blasphemous eldritch gaze at a visible target within 40 ft. Any creature caught in the 40-ft. gaze of the burning skull suffers the following ill effects. The effects are cumulative and concurrent. A successful DC 23 Will save reduces or eliminates these effects. Creatures affected by multiple effects make only one save and apply the result to all the effects. Killed: Living creatures die. Undead creatures are destroyed. Save negates. 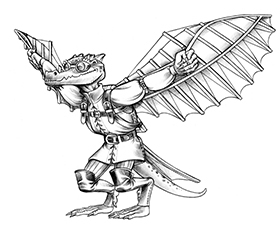 If the save is successful, the creature instead takes 3d6 +17 points of damage (1 point per caster level, maximum +25). 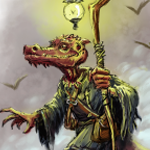 Creatures whose Hit Dice exceed the caster level (17 or greater) are unaffected by the gaze. Slot none; Price 27,000 gp; Weight 3 lbs. This double recorder is hewn from a strange, pale ivory not of this earth. When a player of the pipes of madness succeeds on a DC 15 Perform (wind instruments) check, the pipes emit a weird strain of alien music. Those within 100 ft. who hear the tune must succeed on a DC 20 Will save or suffer a continuous confusion effect, as the spell insanity. Pipes of madness can be sounded five times per day. Slot none; Price 66,600 gp; Weight 3 lbs. This curious jade rod is tipped with a glowing knob of crimson and shimmers with eldritch phosphorescence like a live thing. The wielder of the rod of hellish grounding gains darkvision 60 ft. and benefits from a continuous cat’s grace effect. When the rod is aimed at a grounded metal or alloy, the wielder can project a ray of crimson fire as a standard action. Following a successful ranged touch attack, a thin, red fire-beam travels directly to the target object in a straight line. Any living creature intersected by the crimson ray takes 12d6 points of damage, as the spell disintegrate. Any creature reduced to 0 or fewer hit points by this ray is entirely disintegrated, leaving behind only a trace of fine dust. A disintegrated creature’s equipment is unaffected and (unlike disintegrate) the rod of hellish grounding has no damaging effect on non-living targets. A creature hit by the ray that makes a successful DC 19 Fortitude save is partially affected, taking only 5d6 points of damage. If this damage reduces the creature to 0 or fewer hit points, it is entirely disintegrated. Only the first creature struck can be affected; that is, the ray affects only one target per activation. So your articles recently convinced me to go back and read the entire Conan collection in order (depending on which timeline you believe in). I completely enjoyed them. Thanks for rekindling my interest in Howard. It’s an honor to preach the good word of Two-Gun Bob. As I always say: keep your friends close, and your Conan library closer! I would say go with published timeline or when REH finished drafts for submission. He said they’re not in chronological order because they’re supposed to be like tales told in taverns, not always in order and usually the first thing that comes to mind for the teller. I just read Howard’s “Red Nails” for the first time and the Rod of Hellish Grounding is perfectly rendered here. Good job! Thanks for the kind feedback! It was a labour of love. (The sick love of evil sorcery, that is). Is the disintegrate beam limited to 3 uses per day as is typical for rods? I see no mention of that in the description and it would be pretty overpowered if it was unlimited uses. Great question, Jeff. I wrestled with that one, but in the end I wanted to stay true to the story. Tolkemec emerged from the catacombs below Xuchotl with the “wand” he’d found and promptly started zapping anything that moved. My initial prescription for balance is to arm players with a more detailed (and appropriately restrictive) battlefield than one might normally provide, and/or limit the rod’s use to specific areas. You are correct: it is a bit overpowered. I chalk it up to an old-school, Gygaxian aesthetic when it comes to lethality. Perhaps we should also jack up the gp cost (one of my own trouble spots when it comes to magic item design). Great stuff Chris! I always wondered how the Burning Skull would translate into game terms. I think you nailed it man! Once I was the master and you were the apprentice. No longer! Well done!